The 2010 "Dietary Guidelines for Americans" recommends that adults eat 2.5 cups of vegetables from a wide variety of vegetable choices compared to the 1.6 cups that adults currently average. A Crock-Pot or other brand of slow cooker provides a lot of new recipe options for busy people trying to increase their intake of vegetables. The basic cooking guidelines are very simple, freeing you up to try a multitude of variations and interesting flavors. Cut carrots into uniform pieces of about 1 inch in order to ensure even cooking. Add carrots and the seasonings of your choice to the slow cooker. Pour liquid in the form of water, stock or wine over the carrots and seasonings. To ensure that the carrots do not dry out during cooking, the liquid should be just short of covering the carrots. Cover the slow cooker with a lid and set on low for four to six hours or high for two to three hours. Test the carrots with a fork to see if they are done. 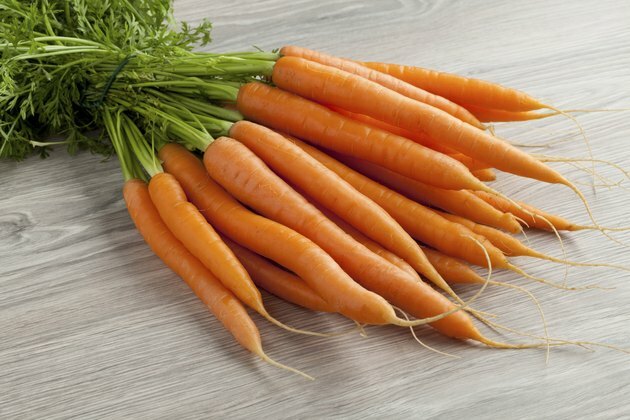 The fork should be able to pierce the carrots easily when cooking is complete. Turn the slow cooker off, remove the carrots and serve. To make cleanup easier, fill the slow cooker with water immediately after removing the carrots and allow it to soak during your meal. Use the cooking water to flavor soups, stews and sauces. Long cooking time in water will result in some loss of water-soluble vitamins, such as vitamin C.